Using a simple home router at work isn’t a great idea. A heavy workload will trip up most domestic routers and they’ll lack features a business needs like high-speed VPNs, robust file sharing, captive portals and advanced filtering. The Asus AC2600 BRT-AC828 is designed from the ground up to be a perfect fit for small businesses. Wi-Fi speeds are top notch as there’s a 4×4 stream 802.1 lac radio with MU-MIMO support, so literally hundreds of users can be connected to the router at once. Most routers only come with four or five Ethernet but the BRT-AC828’s built-in 8-port gigabit switch is perfect for hooking up fixed devices such as a NAS, printer or IP cameras. The 1.7GHz dual-core CPU and 512MB of RAM are a speedy platform to run the multitude of services Asus has included in the BRT-AC828. If you’ve ever used a consumer level Asus router, the interface is the same and one of the easiest to use on the market. Amongst the basics that are in most routers, there’s advanced QoS that can prioritize VoIP or Dropbox/Google Drive data, as well as limit individual user’s bandwidth. 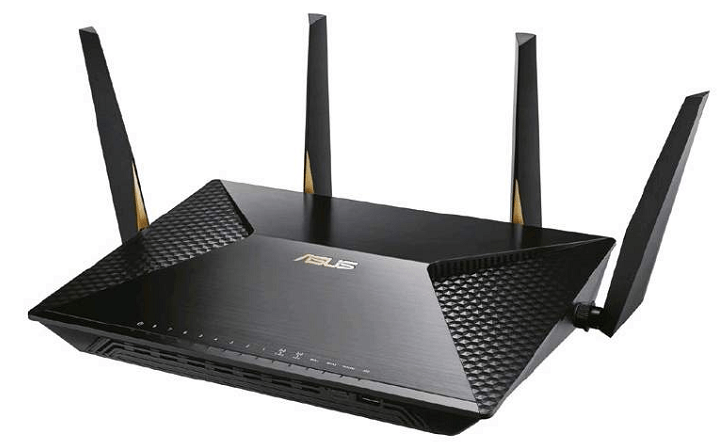 Unlike most all-in-one routers, Asus includes a full blown OpenVPN server, which is one of the more secure and easy to use VPN variants, alongside PPTP and IPSec protocols. Asus’s popular AiProtection intrusion protection system is in full-flight on the BRT-AC828 and is backed by Trend Micro to detect any miscreants trying to get into your network. Attacks are stopped in real time and any infected clients already on your network can be neutralized so they don’t spread across the network. One thing that’s particularly unique for a router like this, is the M.2 SSD slot. The slot supports 2280/2260/2242 sized M.2 modules, but not the faster PCIe NVMe variants. M.2 SSDs aren’t much pricier than their 2.5in brethren, so filling up the BRT-AC828 with a 1TB drive for your businesses files instead of a dedicated NAS is a realistic idea and keeps everything contained to a single point of administration. A super useful feature on the BRT-AC828 that businesses will appreciate, is the ability to create a free Wi-Fi portal. This setup is ideal for providing Wi-Fi to customers without giving them access to your internal network. You can set up a splash page when users connect and set access restrictions. Users simply scan for your network, join it and are taken to a captive portal to connect. Networking wise, the asus ac2600 dual-band wifi router supports all the good stuff like WAN failover between either an LTE USB modem or a secondary Ethernet WAN connection. This is great for ensuring your business stays connected even if the primary Internet connection fails. VLAN and 802.3ad LAN teaming support is available for more advanced setups. The BRT-AC828 has a VESA mount on the back, just like a monitor or TV. If you need to mount it so people don’t get tempted to mess with it, just use a standard 100mm x 100mm bracket. There’s also an optional server rack kit, which is ideal for mounting in the small communications cupboards that are common in most offices. Luckily, the antennas are detachable, so you can run a short patch lead if required. At this price-point, the BRT- AC828’s competitors are high- end Draytek units and entry- level Meraki or Ubiquiti gear. Compared to the Draytek routers, the BRT-AC828 has a superior 4×4 802.11ac radio and a much nicer administration interface. When put alongside a few Ubqiuiti UniFi APs, a switch and the UniFi Security Gateway, the BRT-AC828 is easier to configure and still packed with features the UniFi doesn’t have, such as file sharing, 4G failover and out of the box OpenVPN support. Taking that into consideration, the Asus BRT-AC828 is a perfect solution for a small business or advanced home user that wants a no-nonsense single box networking solution. Every feature you’d want is here and a piece of cake to setup compared to other products.